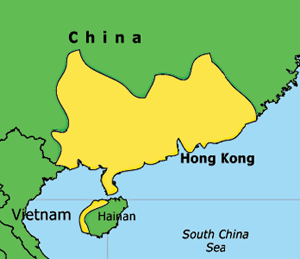 Cantonese is the official language of Hong Kong and Macao. Furthermore it is the language used in daily life in large parts of Southern Mainland China including Guangdong, Guangxi, Hainan and Fujian. But Cantonese is not just spoken in China. Cantonese speaking communities exist in many Asian countries like Singapure, Malaysia or Vietnam. In Australia, Canada, UK or USA many former Chinese immigrants originally lived in the South of China and still speak Cantonese at home. The term "Cantonese" goes back to the province Guangdong (Canton) in the South of China. The exact term for this language family would actually be Yue Chinese (粤语) with Cantonese just representing a subgroup of accents. Today, however, the terms "Yue Chinese" and "Cantonese" can both be used and are pretty much interchangeable. Mandarin today is the main language spoken in China and strongly supported by the government as standard language. The number of people speaking Mandarin (over 1 billion) is therefore a lot higher than the number of people speaking Cantonese (at least 70 million). In the South of China, however, people still prefer Cantonese over Mandarin and use it extensively not just in daily life but also for doing business or on TV. Languagewise Cantonese is a lot closer to ancient Chinese than Mandarin in that words and sentences are usually shorter and many reforms made for Mandarin did not have an impact on Cantonese. As a result of that, Cantonese, for example, still uses traditional characters whereas Mandarin, in most areas, uses simplified ones. With 9 tones Cantonese is also the language with most tones, Mandarin thereby "just" having four. The nature of the tones, however, is also different in Mandarin and Cantonese, so foreigners might find learning Cantonese tones easier than learning the four tones in Mandarin. The differences in the two languages do also have a significant impact on culture. Just to give one example, in the parts of China using Mandarin, 您 is used a lot to express respect whereas 你 is used for daily life activities. Both mean "you", but similarly to German or other languages, using the kind way of addressing somebody is inevitable sometimes. In Cantonese, however, 您 is not used, as there is no commonly used equivalent for it, making, for example, teacher-student relationships in the North and South of China quite different. Cantonese is not Cantonese - it differs quite significantly from one place to the other and native Cantonese speakers usually can tell from your language where you come from. Guangzhou accent is widely regarded as the most standard form of Cantonese. The influence of English on Hong Kong Cantonese makes it differ quite significantly to Mainland Cantonese. The Cantonese in Shenzhen, on the other hand, was and still is influenced by the many Mandarin speaking people living there, which results in a lot of "imported" words, Hong Kong people wouldn't really use. For more information on this, please check out the pronounciation section. Having said all that and given that Cantonese is a living language, it is difficult to present one language and if you learn that, you are able to speak Cantonese. The best way to study is to use many sources, hopefully this being one of them. The Cantonese here doesn't concentrate on any single accent but tries to provide words commonly used and helpful phrases enabling especially beginners to get to a level at which they can communicate with people quickly.